SAN DIEGO, Nov. 13, 2018 /PRNewswire/ -- Youngevity International, Inc. (YGYI) (NASDAQ: YGYI), a leading omni-direct lifestyle company, today reported financial results for the third quarter and nine months ended September 30, 2018. Steve Wallach, CEO and Co-Founder of Youngevity stated, "The third quarter's revenue was negatively impacted by supply chain challenges experienced predominantly in our international markets and a policy change implemented by our finance company within the coffee segment, however, despite these challenges, our year to date numbers continue to improve over last year in key financial metrics including Revenue, Operating Income and Adjusted EBITDA." 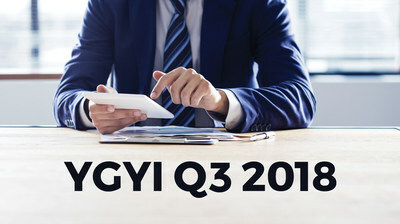 Youngevity President and CFO, Dave Briskie stated, "We are not satisfied with our sliding revenue for the third quarter, however we are pleased to see our margins as a percentage of revenue showing significant progress this quarter. We have been eliminating promotions that drive top line revenue at the expense of profits and we are seeing a positive trend toward our stated goal of improving operating profits and Adjusted EBITDA in 2018. We intend to focus the balance of this year on improving our balance sheet, driving international growth, and positioning the coffee segment to execute its significant green coffee contract that we anticipate will greatly impact the performance of the coffee segment in 2019." For the three months ended September 30, 2018, our revenues decreased 12.0% to $39,082,000 as compared to $44,395,000 for the three months ended September 30, 2017. We derived approximately 88% of our revenue from our direct selling sales and approximately 12% of our revenue from our commercial coffee sales. Direct selling revenues decreased by $3,674,000 or 9.7% to $34,280,000 as compared to $37,954,000 for the same period last year. We attribute this decrease primarily to a general weakness in North America direct selling business and supply chain challenges that predominantly negatively impacted revenues in the international markets. In addition, the Company changed its promotion strategy whereby it has significantly reduced promotions that impacted top line revenues through discounting while maintaining commission levels. The promotion in the current quarter targeted products with higher gross margins and utilized incentives that had less costly impact on profitability. For the three months ended September 30, 2018, commercial coffee segment revenues decreased by $1,639,000 or 25.4% to $4,802,000 as compared to $6,441,000 for the three months ended September 30, 2017. This decrease was primarily attributed to a decrease of $2,458,000 in green coffee sales, offset by an increase of $819,000 in roasted coffee sales. The decrease in green coffee sales was primarily due to our domestic finance company no longer willing to fund the green coffee business, which caused a temporary disruption in sales. For the three months ended September 30, 2018, gross profit decreased approximately 8.0% to $23,712,000 as compared to $25,764,000 for the three months ended September 30, 2017. Overall gross profit as a percentage of revenues increased to 60.7%, compared to 58.0% in the same period last year. Gross profit as a percentage of revenues in the direct selling segment increased to 68.9% for the three months ended September 30, 2018, compared to 67.1% in 2017, primarily due to the price increases on certain products that went into effect on January 1, 2018 and changes to our product sales mix and no commensurate increase in related expenses. For the three months ended September 30, 2018, our operating expenses decreased 8.9% to $25,118,000 as compared to $27,581,000 for the three months ended September 30, 2017. Distributor compensation expense decreased 13.3% to $15,076,000 from $17,391,000 for the same period last year. This decrease was primarily due to the lower revenues discussed above. Distributor compensation as a percentage of direct selling revenues decreased to 44.0% for the three months ended September 30, 2018 as compared to 45.8% for the same period last year. This was primarily attributable to the price increases reflected in revenues, which did not impact commissionable base revenues. Sales and marketing expense decreased 2.7% to $3,962,000 from $4,074,000 for the same period last year. In the direct selling segment, sales and marketing costs decreased by 3.6% to $3,747,000 in the current quarter from $3,887,000 for the same period last year. This was primarily due to lower compensation costs and lower convention costs in the current quarter compared to the same quarter last year. General and administrative expense decreased 36.6% to $3,880,000 from $6,116,000 for the same period last year primarily due to the contingent liability revaluation which resulted in a benefit of $2,618,000 for the three months ended September 30, 2018 compared to a benefit of $340,000 for the same period last year. This benefit included a $2,200,000 adjustment to our contingent liability related to one of our acquisitions due to a substantial decrease in projected revenues. General and administrative expense also decreased due to lower legal expense and compensation expense, offset by increases in depreciation and amortization expense and investor relations expense. We recorded a $2,200,000 loss on impairment of intangible assets for the three months ended September 30, 2018, related to the same acquisition for which the Company had a significant revaluation of the contingent liability discussed above. Operating loss decreased to a loss of $1,406,000 compared to a loss of $1,817,000 for the same period last year. Total other expense increased by $6,404,000 to $6,945,000 as compared to $541,000 for the same period last year. Net interest expense decreased by $345,000 to $1,407,000 compared to $1,752,000 for the same period last year. Change in fair value of derivative liabilities increased by $7,057,000 for the three months ended September 30, 2018 to a $5,538,000 expense compared to a benefit of $1,519,000 for the same period last year. Various factors are considered in the pricing models we use to value the warrants including our current stock price, the remaining life of the warrants, the volatility of our stock price, and the risk-free interest rate. The increase in the change in fair value of the warrant derivative was primarily due to the increase in the Company's stock price. We reported a net loss of $8,410,000 as compared to net loss of $1,068,000 for the same period last year. The increase in net loss was a result of the increases in other expense discussed above and the decrease in gross profit, offset by a decrease in operating expense. In addition, we recorded an income tax expense of $59,000 in the current quarter compared to an income tax benefit of $1,290,000 for the same period last year. EBITDA (earnings before interest, income taxes, depreciation and amortization) as adjusted to remove the effect of stock based compensation expense, the non-cash loss on impairment of intangible assets, the non-cash loss on extinguishment of debt and the change in the fair value of the warrant derivative or "Adjusted EBITDA," increased to $2,670,000 for the three months ended September 30, 2018 compared to a negative $359,000 for the three months ended September 30, 2017. A reconciliation of Adjusted EBITDA to net loss is set forth below. For the nine months ended September 30, 2018, our revenues increased 1.3% to $126,331,000 as compared to $124,655,000 for the same period last year. We derived approximately 84% of our revenue from our direct selling sales and approximately 16% of our revenue from our commercial coffee sales. For the nine months ended September 30, 2018, direct selling segment revenues decreased by $297,000 or 0.3% to $106,437,000 as compared to $106,734,000 for the same period last year. Commercial coffee segment revenues increased by $1,973,000 or 11.0% to $19,894,000 for the nine months ended September 30, 2018, as compared to $17,921,000 for the same period last year. This increase was primarily attributed to increased revenues from our roasted coffee business and green coffee business. Gross profit increased approximately 3.3% to $74,106,000 for the nine months ended September 30, 2018 as compared to $71,732,000 for the same period last year. Overall gross profit as a percentage of revenues increased to 58.7%, compared to 57.5% in the same period last year. This increase was primarily due to the price increases in the direct selling segment on certain products that went into effect on January 1, 2018 and changes to our product sales mix and no commensurate increase in related expenses. For the nine months ended September 30, 2018, our operating expenses decreased 2.3% to $74,835,000 as compared to $76,625,000 for the same period last year. Distributor compensation decreased 4.8% to $47,141,000 from $49,496,000 for the same period last year. Distributor compensation as a percentage of direct selling revenues decreased to 44.3% for the nine months ended September 30, 2018 as compared to 46.4% for the same period last year. This decrease was primarily attributable to the price increases reflected in revenues, which did not impact commissionable base revenues. Sales and marketing expense decreased by $113,000 to $10,537,000 from $10,650,000 for the same period last year. General and administrative expense decreased 9.2% to $14,957,000 from $16,479,000 for the same period last year primarily due to a benefit of $4,076,000 from the contingent liability revaluation for the nine months ended September 30, 2018 compared to a benefit of $1,020,000 for the same period last year. The revaluation in the current year included a $2,200,000 adjustment to our contingent liability in the current quarter related to one of our acquisitions due to a substantial decrease in projected revenues and a $1,246,000 benefit in the second quarter of the current year as a result of eliminating the contingent liability related to an acquisition due to breach of the asset purchase agreement by the seller. Legal expense, IT related costs and workers compensation expense also decreased for the nine months ended September 30, 2018. These decreases in general and administrative expense were offset by increases in depreciation and amortization costs, investor relations, stock-based compensation, accounting costs and increases in costs related to operations in Russia, Mexico, Taiwan, Colombia and New Zealand. Operating loss decreased by $4,164,000 to an operating loss of $729,000 for the nine months ended September 30, 2018 as compared to an operating loss of $4,893,000 for the same period last year. Total other expense increased by $6,657,000 to $10,384,000 as compared to $3,727,000 for the same period last year. Net interest expense increased by $461,000 to $4,668,000 compared to $4,207,000 for the same period last year. Change in fair value of derivative liabilities increased by $5,422,000 to $4,634,000 expense compared to a benefit of $788,000 for the same period last year. Various factors are considered in the pricing models we use to value the warrants including our current stock price, the remaining life of the warrants, the volatility of our stock price, and the risk-free interest rate. The increase in the change in fair value of the warrant derivative was primarily due to the increase in the Company's stock price. We recorded a non-cash extinguishment loss on debt of $1,082,000 for the nine months ended September 30, 2018 as a result of the triggering of the automatic conversion of the 2017 Notes associated with our July 2017 Private Placement to common stock. We reported a net loss of $11,332,000 for the nine months ended September 30, 2018, as compared to a net loss of $5,857,000 for the same period last year, as a result of the increase in other expense discussed above, offset by increases in gross profit and decreases in operating expense. In addition, we recorded an income tax expense of $219,000 for the nine months ended September 30, 2018 as compared to an income tax benefit of $2,763,000 for the same period last year. EBITDA (earnings before interest, income taxes, depreciation and amortization) as adjusted to remove the effect of stock based compensation expense, the loss on impairment of intangible assets, the non-cash loss on extinguishment of debt and the change in the fair value of the warrant derivative or "Adjusted EBITDA," increased to $6,393,000 for the nine months ended September 30, 2018 compared to a negative $851,000 for the same period last year. A reconciliation of Adjusted EBITDA to net loss is set forth below. Adjusted EBITDA is a non-GAAP financial measure. We calculate adjusted EBITDA by taking net income, and adding back the expenses related to interest, income taxes, depreciation, amortization, stock based compensation expense, loss on impairment of intangible assets, the non-cash loss on extinguishment of debt and the change in the fair value of the warrant derivative, as each of those elements are calculated in accordance with GAAP. Adjusted EBITDA should not be construed as a substitute for net income (loss) (as determined in accordance with GAAP) for the purpose of analyzing our operating performance or financial position, as Adjusted EBITDA is not defined by GAAP. A reconciliation of Adjusted EBITDA to net loss is provided in the tables at the end of this press release. Youngevity International, Inc. ( NASDAQ : YGYI ), is a leading omni-direct lifestyle company -- offering a hybrid of the direct selling business model, that also offers e-commerce and the power of social selling. Assembling a virtual Main Street of products and services under one corporate entity, Youngevity offers products from the six top selling retail categories: health/nutrition, home/family, food/beverage (including coffee), spa/beauty, apparel/jewelry, as well as innovative services. The Company was formed in the course of the summer 2011 merger of Youngevity Essential Life Sciences with Javalution® Coffee Company (now part of the company's food and beverage division). For investor information, please visit YGYI.com. Be sure to like us on Facebook and follow us on Twitter. This release contains forward-looking statements within the meaning of the Private Securities Litigation Reform Act of 1995. In some cases, forward-looking statements can be identified by terminology such as "may," "should," "potential," "continue," "expects," "anticipates," "intends," "plans," "believes," "estimates," and similar expressions, and includes statements such as seeing a positive trend toward our stated goal of improving operating profits and Adjusted EBITDA in 2018, focusing the balance of this year on improving our balance sheet, driving international growth, and executing the significant green coffee contract to greatly impact the performance of the coffee segment in 2019. These forward-looking statements are based on management's expectations and assumptions as of the date of this press release and are subject to a number of risks and uncertainties, many of which are difficult to predict that could cause actual results to differ materially from current expectations and assumptions from those set forth or implied by any forward-looking statements. Important factors that could cause actual results to differ materially from current expectations include, among others, our ability to improve operating profits and Adjusted EBITDA in 2018, our ability to improve our balance sheet, drive international growth, and position the coffee segment to execute its significant green coffee contract greatly impacting the performance of the coffee segment in 2019, our ability to continue our coffee segment growth, our ability to leverage our platform and global infrastructure to drive organic growth, our ability to improve our profitability, expand our liquidity, and strengthen our balance sheet, our ability to continue to maintain compliance with the NASDAQ requirements, the acceptance of the omni-direct approach by our customers, our ability to expand our distribution, our ability to add additional products (whether developed internally or through acquisitions), our ability to continue our financial performance, and the other factors discussed in our Annual Report on Form 10-K and our subsequent filings with the SEC, including subsequent periodic reports on Forms 10-Q and 8-K. The information in this release is provided only as of the date of this release, and we undertake no obligation to update any forward-looking statements contained in this release on account of new information, future events, or otherwise, except as required by law. Youngevity International (NASDAQ:YGYI) is down 17% after posting a Q3 loss. Commercial coffee segment revenues fell 25% to $4.80M during the quarter. The company says supply chain challenges experienced in the international markets and a policy change implemented by its finance company within the coffee segment impacted results negatively. CEO update; "We are not satisfied with our sliding revenue for the third quarter, however we are pleased to see our margins as a percentage of revenue showing significant progress this quarter. We have been eliminating promotions that drive top line revenue at the expense of profits and we are seeing a positive trend toward our stated goal of improving operating profits and Adjusted EBITDA in 2018. We intend to focus the balance of this year on improving our balance sheet, driving international growth, and positioning the coffee segment to execute its significant green coffee contract that we anticipate will greatly impact the performance of the coffee segment in 2019."